Customer had 2 Diamond signet rings that he no longer wore but were very sentimental. He had an idea to take the stones from the rings and have them made into pendants to give to his wife. 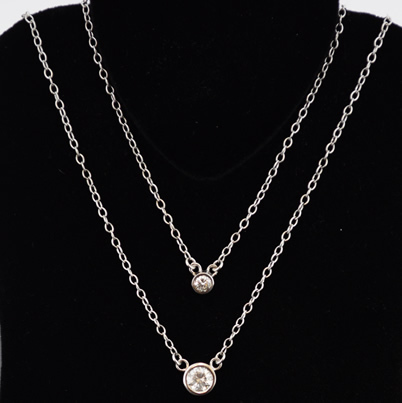 We decided on a design and created two 23 inch trace chains in 9ct white gold with each Diamond set into a rub over setting. The finished chains looked great. This entry was posted on Tuesday, June 18th, 2013 at 12:20 pm	and tagged with diamond necklace, diamond ring remodel, diamonds, jewellery remodel, remodel diamonds and posted in Jewellery Repair. You can follow any responses to this entry through the RSS 2.0 feed.